Oh, that rings so many bells. Having written about my twenty- to twenty-four-year-old self in The Mad Artist, I discovered that however much you try to stick to the truth or the facts, you cannot help but turn yourself and others into ‘characters’, and characters start to assume a destiny of their own on the page. For me the writing of a ‘novelistic memoir’ was both an act of serving up reality and one of full literary performance at the same time. The implied secret is that one of the smartest ways to write fiction today is to say that you’re not, and then do whatever you very well please. Fiction writers take note. Some of the best fiction is now being written as nonfiction. I’ve always had a hard time writing fiction. It feels like driving a car in a clown suit. You’re going somewhere, but you’re in costume, and you’re not really fooling anybody. I first read A Million Little Pieces after the controversy, so I knew what I was absorbing wasn’t strictly ‘the facts’. Quite apart from the controversy-causing passages, the whole thing seemed to me very ‘fictional’, the scenes orchestrated to push forward the ‘plot’, the characters larger than life and many of the happenings farfetched, stretching credibility without altogether breaking it in exactly the way fiction does. I still enjoyed it as a read and wouldn’t have asked for my money back had I not had the benefit of the newly written disclaimer. Of course there’s nothing new about partially or wholly faked drug memoirs. Go Ask Alice by Anonymous was published in the early ’70s as the diary of a teenage girl who graduates from the Adrian Mole-type stuff onto LSD and is sucked into the drug scene, eventually getting hooked on heroin. We took it at face value back then, though the stereotypicality of its arc as a cautionary drug tale might have caused doubts in the minds of sophisticated readers. Later it was revealed that the book’s editor was the sole copyright holder, and she admitted to a certain amount of ‘fictioneering’. As there is a notable lack of evidence that either the original diarist or diary ever existed, then the veracity of the whole book has come into question. Similarly The Teachings of Don Juan and subsequent works by anthropologist Carlos Castaneda—which purport to be a record of the author’s apprenticeship to a psychedelic drug-using Yaqui Indian sorcerer—have been shown to be full of implausibilities and internal inconsistencies, and the degree to which they have been faked is still a matter of debate. Nonetheless the cult of don Juan has grown and grown, and his new age sagacity and lists of didactic hints for those challenging existential moments has transcended all fact/fiction dichotomy, much as holy books do for true believers. Then there is the other side of the coin, the roman à clef, the novel based on real events, which customarily attempts to disclaim the relationship to reality in much the same way as the memoir tries to assert it—often in the case of drug material because the author is still engaged in illegal activity. William Burroughs’ first novel Junkie is such a case, being a pretty faithful record of the early phase of his heroin addiction and involvement within the ’50s drug scenes in New York, New Orleans and Mexico City, originally published under the pen name ‘William Lee’—the name of the narrator. It still remains one of finest factual accounts of addiction that we have, and had Burroughs renounced drugs at the time, then it might instead have emerged as a memoir. Interestingly Shields makes the point that De Quincey’s Confessions of an English Opium Eater is written from the standpoint of its author now being ‘off drugs’, which wasn’t actually the case. Even as early as the 1820s the familiar moral position of the drug memoirist as someone who’d ‘put all that behind him’ had become established. In a famous drug ‘memoir’ from 1991, PiHKAL–A Chemical Love Story, by Alexander and Ann Shulgin, the account of their synthesis of various phenethylamine-based compounds is mythologised and presented on a grand canvas as heroic alchemy and romance. Fictional names are used and much of the text is deliberately highly subjective. As the disclaimer states, this approach provided an element of cover and obfuscation in case the authorities came knocking on the doors of their lab, which indeed they have. In contrast to so-called ‘fake memoirs’, one couldn’t have a drug memoir that is more real, authentic and unfictionalised than The Doors of Perception, even though it was written by eminent novelist Aldous Huxley. Having become a master of the art of inventing narrative, Huxley could, in this case, faithfully devote himself to the real, unencumbered by the need to experiment with blending fact and fiction as developing writers will inevitably do. Fear and Loathing in Las Vegas is perhaps the perfect artistic fusion of the elements of memoir and novel in a drug-experience book. Based on a real occurrence—Hunter Thompson’s visit to Las Vegas to cover a desert race for a magazine, and full of wry observation and reportage—it is nonetheless fictionalised, using the name ‘Raoul Duke’ for the narrator, and replete with inventive, novelistic flourishes. But the whole is such an excellent piece of writing, succeeding in both capturing the true maelstrom of LSD in a way that any initiate will recognise, and also presenting a cautionary tale that will satisfy anti-drug sentiment, that any analysis of its artifice is rather pointless. 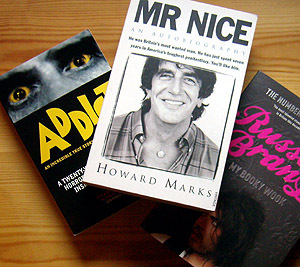 The most successful British drug memoir of recent times has been Howard Marks’ Mr Nice, which has turned the former cannabis smuggler into a national treasure and has been recently filmed. As regards compiling his adventures, Marks says that, for obvious reasons, he kept no diaries, but was aided by the biographies of himself already published and numerous press cuttings. However the best ever record—and aid to memory—came in the form of legal depositions compiled by drug enforcement agencies over the years and used against Marks at his trail in America. He paid two thousand pounds to have them shipped to England, and they proved to be the most accurate chunk of ‘reality’ one could ever wish for. In another British drug memoir, Addict, the narrator (author?) is so unreliable, being smashed on amphetamines, alcohol, acid, downers and who knows what else for most of the tale, as well as being a sometime mental patient and receiver of memory-blanking electroshock therapy, that no one—probably not even the subject himself—can be sure of where the divide between fact and invention lies. All these books have vastly different etiologies, intentions and relationships of fact to fiction; and beyond writing about drugs or anything else, it’s much the same in the culture at large, a point Shields expands upon as Reality Hunger continues. He dissects reality TV—‘a hybrid mutant of documentaries, games shows, and soaps’—cites various performance artists who use ‘found reality’ in their work, and charts the rise of sampling in music and the emergence of the DJ as mashup artist, a creator in his own right. 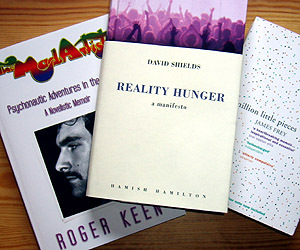 In manifesto mode, he asserts the right of the creator to borrow, and analyses the clash of ideologies when such borrowing infringes copyright, as is the case of Beatles sampling, which is illegal. And finally, where does all this leave me? Well, to quote one of the review excerpts from the book’s front matter: ‘It’s a pane that’s also a mirror; as a result of reading it, I can’t stop looking into myself and interrogating my own artistic intentions.’ And I can’t help but see my own artistic journey—from reality to fiction and back to reality—reflected in every page. When I had my first, and most momentous, acid trip, I discovered among many other things that at last something sufficiently ‘epic’ had happened in my life to be worth writing about in a form that would be communicable to others. Over the next few years I had many other drug experiences whilst at the same time developing a framework within which to write about them. 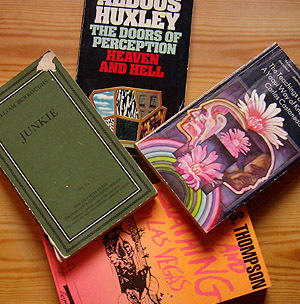 The result was several partial ‘novels’, none of which quite worked, because even though I’d seen the light of true reality fiction in a later important mushroom trip and initiated The Cult of the Novel, I nevertheless went on to ‘lose the plot’ as the years passed. 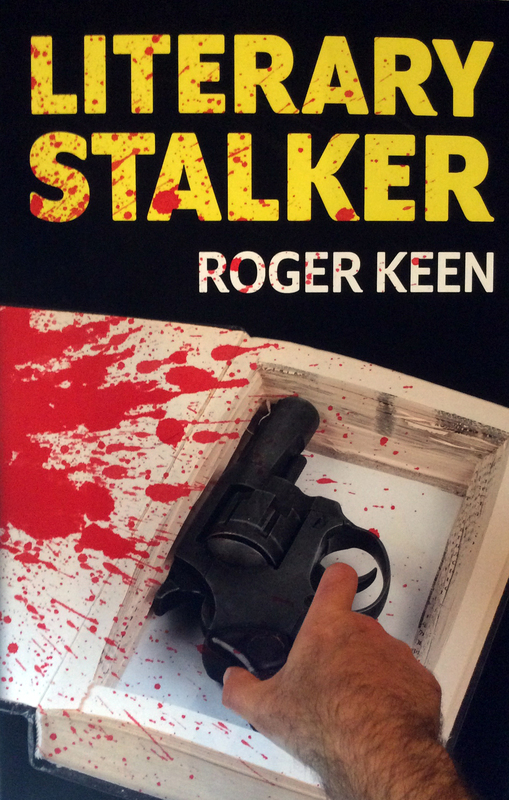 It was only when I’d finally resolved in my own creative consciousness the dichotomy between writing-as-fact and writing-as-fiction that I was able, some thirty years on, to put the material into an acceptable form and complete a book. My solution was to let reality be the governor rather than fiction; in short to write a work of non-fiction rather than a novel and dispense with the desire to shape everything according to some pre-ordained aesthetic formula. What I discovered, amazingly, was how little the material, the writing, was changed in this new order.